A contract for EUR 14 million with the company Petrolinks Handels GmbH had been presented by a firm of Ginka and Slavcho Varbakovi to the Bulgarian State Commission for Energy and Water Regulation (DKEVR) in 2010 to obtain a license for the production of electricity from a solar park near the town of Apriltsi. The company was an Austrian one and is owned by Deyan Dobrev, son of Stanko Stankov, the owner of “Bulmarket”, and Petyo Sertov, a nephew of Petko Sertov, the former head of the National Security Agency (DANS), an investigation by Bivol reveals. It also proves that Ginka Varbakova had presented to DKEVR a forged document for EUR 200 million as a “first-rate bank guarantee” issued by some Italian fraudsters. The solar project of “Real States” near Apriltsi had been presented by Slavcho Varbakov as “the largest photovoltaic park in Europe” with a total power of 80 megawatts, as reported by the Bulgarian daily Dnevnik on April 30, 2010. The local officials had big hopes for the investment of EUR 200 million and did everything to cooperate with and help Varbakovi. The alarming report of local media “Videlina”, based in the city of Pazardzhik, that Varbakovi’s company had felled and sold 5,000 cubic meters of timber from a municipal plot given to it for the solar park project had not been able to dim the hopes for a bright photovoltaic future. One year after the groundbreaking, made personally by the mayor of Pazardzhik and the regional governor, Dnevnik reported that the first stage of 1.15 megawatts was ready and put into operation. The publication quoted Ginka Varbakova promising to have all 80 megawatts in operation by 2014. However, there is no next stage. “Real States” had not even paid the license fee and accumulated BGN 22,000 in obligations to DKEVR for which the regulator had issued a sanctioning act at the end of 2015. In 2016, “Real States” has applied to DKEVR for termination of the electricity production license. The application states that the company “had not started construction and had no unfinished facilities” and that there were no facilities in operation. When “Real States” applied for a license from DKEVR, it had been the sole property of Petrana Paytakova, the mother of Ginka Varbakova, for which Bivol revealed that she has three social security numbers (known as unified civil number(s), EGN). But Ginka Varbakova was authorized to represent her before DKEVR. As proof of the seriousness of the investment intention, she had presented a first-rate bank guarantee for EUR 200 million from DEANFIELD SOLUTIONS Merchant and Trade Finance and a contract with Petrolink Handels for a loan of EUR 14 million. It had been stated before DKEVR that Petrolink Handels would be involved in the logistics of the delivery of the equipment for the photovoltaic park whose capacity is listed as 60 megawatts, not 80. The collateral for the loan was a mortgage on a part of the solar project and a pledge of future revenues from the sale of electricity after the construction of the park. Petrolinks Handels GmbH is an Austrian company founded in 2006 by Deyan Dobrev under the name Dobrev GmbH. Immediately afterwards it has been renamed Petrolinks and Petyo Sertov has been appointed for manager. After 2010, the company changed its name again and is now called Bluewave GmbH, which makes it difficult to find it in the registers. Deyan Stankov Dobrev is the son of Stanko Stankov from “Bulmarket DM”, the company whose tanks exploded near the village of Hitrino causing fatalities and material damage. At the same time, when he signed the credit agreement with “Real States”, Deyan Dobrev was a partner with Slavcho Varbakov in the company “Global Hydro Energy Consult”. So, it transpires that he had provided a loan to his partner’s mother-in-law through his Austrian firm. Of course, there is nothing wrong with that, but the Austrian company’s financial statements show that it has a capital of only EUR 35,000 and its turnover is negligible. The origin of the amount of EUR 14 million is obviously not Dobrev’s Austrian business. One possible explanation for this is the fact that at the same time back then, a company called “Petrolinks”, which was 100% owned by “Bulmarket DM”, was operating in Bulgaria. It is now named “Correct Test Control”. As Bivol’s investigation revealed after the deadly blast near Hitrino, the company owner of the tanks – “Bulmarket-DM”, was then owned by the unemployed Cypriot national Georgios Georgiou. According to admissions of Bulgarian Prime Minister Boyko Borisov, the Cypriot is a strawman of the co-owner of First Investment Bank (FIB or Finbank) Tseko Minev. On his part, Stanko Stankov publicly claimed that he was the sole owner of “Bulmarket”. Documents discovered by Bivol refuted him, and he was filmed on camera by our team leaving the head office of Fibank. At that time, “Bulmarket-DM” owed the bank BGN 106 million. A year after the blast, it became clear that Bulmarket’s accounts with Fibank had been emptied and that the victims could not get the compensations they were seeking from the courts. Recently, “Bulmarket DM” has indeed become 100% owned by Stanko Stankov, who has bought the shares of Georgios Georgiou’s offshore. At the same time, the company has transferred its loans from Fibank to other banks, according to Capital daily. 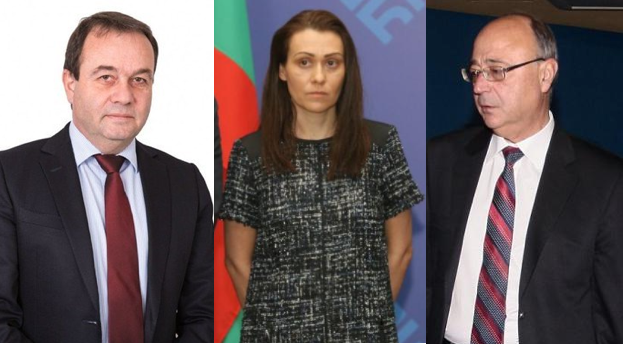 One of the banks absorbing the huge debt to Fibank is the Bulgarian-American Credit Bank (BACB) of Tsvetelina Borislavova – the former live-in girlfriend of Prime Minister Borisov. Thus, “Bulmarket-DM”, which had also been associated with Varbakov’s funding, is increasingly becoming positioned in Borisov’s circle of interests. This circle has a clear link to the deal with the purchase of the Bulgarian assets of the State-owned Czech electric power utility, CEZ, which was revealed by our previous joint investigation with Lidove noviny. The presence of Petyo Sertov in the management of the Austrian “Petrolink Handels” is an interesting fact as well. Petyo Sertov is a nephew of Petko Sertov, the former head of DANS and later boss in the Center for Prevention and Countering Corruption and Organized Crime (Borkor). Petko Sertov has started his career in the communist secret services known as State Security or DS. Bivol’s attempts to obtain a comment from him were unsuccessful. From some public documents, it can be concluded that the entire family of Detelin Sertov, the brother of the former top counter-intelligence officer, lives in Austria. Sertov, himself, has interests in the energy business and after withdrawing from public service, he was acting as a consultant in the company “United Energy Traders” (OET) of energy boss Angel Bozhilov. The first-rate EUR 200-million bank guarantee that Ginka Varbakova has brought to the attention of DKEVR, came from a shell British company that never had any banking activity, a check by Bivol shows. DEANFIELD SOLUTIONS had a website that is no longer active but is kept in an archive. In it, it presents itself as a powerful investment bank. In fact, it is a mailbox company registered in the United Kingdom. It had been closed in 2013 due to insolvency. But the liquidation procedures, and especially the collection of unpaid by the last director, Sergio Pecoraro taxes, have lasted for years, according to data from the British Trade Register. It seems that Pecoraro continues to use DEANFIELD’s name to present himself as an investment broker and attract investors through fraud. A stung American from Kansas has even registered a special website to warn people not to send money to Pecoraro and his company. Roberto Pontiggia, an Italian with a Swiss address, has been one of DEANFIELD’s previous directors. He is an international fraudster wanted by the Bulgarian authorities with a European arrest warrant issued on June 12, 2017. In August 2017, the Italians arrested Pontiggia, but the Genoa court denied the request for extradition to Bulgaria. The reason is that the Italian authorities are also prosecuting Pontiggia on tax evasion charges. At the end of 2017, he was sentenced to three years in prison and a confiscation of EUR 2 million. Pontiggia has several companies in Bulgaria and in one of them he is a partner with the former head of the bankrupt Agrobusinessbank Rumen Nanov. In 2013, Nanov was associated with the mysterious buyer of the Retirement Insurance Fund “Doverie” (Trust), but the deal never happened after the intervention of DANS and the prosecution. The joint company of Nanov & Pontiggia “Flytel” Ltd. has been registered after these events – at the end of 2014 but does not appear to be active. From the hearing of Prosecutor General Sotir Tsatsarov in the ad-hoc Parliamentary Committee on CEZ, it became clear that the Prosecutor’s Office has little desire to probe Varbakovi and their business. At the request of DANS and the administration of the president, it had only inquired whether there were any active cases against Ginka and Slavcho Varbakovi and their company “Inercom”, but the other family businesses had not been checked. We are yet to find out whether the facts outlined above, showing Varbakovi’s association with international fraudsters and their funding from an obscure source linked to the highest echelons of power, will be probed. That a government institution such as DKEVR has been misled by Varbakovi with a fake EUR 200 million “first-rate bank guarantee” in order to obtain a state license is a criminal act. According to the Penal Code, this is a use of a private document of untrue content and is punishable by up to two years of imprisonment. But Ginka and her mother will not be held accountable because the statute of limitation for such a crime is five years and has long since expired. On the other hand, the new Anti-Corruption Commission should be interested in the participation of a close relative of the former DANS chief Petko Sertov in the EUR 14 million scheme. At the very least, it has to be established whether the EUR 14 million loan from the Austrian company of Dobrev and Sertov has been actually used for something and ask the Austrian authorities about the origin of this money.